For 35 years, serving all of Santa Cruz County. Over 6,500 youth and counting. For more than a century, Big Brothers Big Sisters has been helping change kids’ perspectives and giving them the opportunity to reach their potential. It all started in 1904 when a young New York City court clerk named Ernest Coulter was seeing more and more boys come through his courtroom. He recognized that caring adults could help many of these kids stay out of trouble and he set out to find volunteers. That marked the beginning of the Big Brothers movement. At around the same time, the members of a group called Ladies of Charity were befriending girls who had come through the New York Children’s Court. That group would later become Catholic Big Sisters. Both groups continued to work independently until 1977 when Big Brothers Association and Big Sisters International joined forces and became Big Brothers Big Sisters of America. More than 114 years later, Big Brothers Big Sisters remains true to the founders’ vision of bringing caring role models into the lives of children. Big Brothers Big Sisters currently operates in all 50 states—and in 12 countries around the world. In 1982, a study was released indicating that youth from low-income single parent homes had significantly higher dropout and juvenile detention rates. A group of concerned community members came together to address this issue, seeking a substantive solution to this problem. The result was the creation of Big Brothers Big Sisters of Santa Cruz County. 1982 – Big Brothers Big Sisters opened its doors on Seabright Avenue. 1983- The first Bowl for Kids’ Sake at Surf Bowl, now known as Boardwalk Bowl. 1990- All agency materials became available in English and Spanish. 1991 – The first Day on the Monterey Bay Regatta benefit hosted by Santa Cruz Yacht Club. 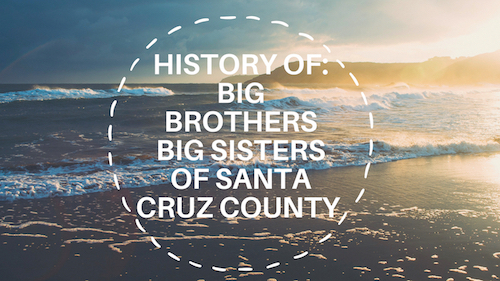 1994- Community leaders approached Big Brothers Big Sisters about deepening their reach to children in South Santa Cruz County. The After School Program was started at a low-income housing complex in Watsonville. 2001- A second After School Program was created at another housing complex in South County. 2007 – 25th anniversary of Big Brothers Big Sisters of Santa Cruz County. Marking over 3,000 kids served. 2012 – 30th anniversary. Marking over 4,500 kids served. 2017 – 35th anniversary. Marking over 6,500 kids served. 2017 – 25th annual Day on the Monterey Bay Regatta. 2018 – 35th annual Bowl for Kids’ Sake event.